In previous two posts Compare two string fields and compare-two-date-fields we have discuss about comparing string and date fields. In this article we are going to discuss how we can check two numeric fields like int , float , long. if() function enable function queries.We can check any condition like other programming language. test is or refers to a logical value or expression that returns a logical value (TRUE or FALSE). This function will check the document field “language”, and if it is “java” return 100, if it is “python” return 50, else return 25. Solr provide five comparison functions eq, lt, lte, gt and gte for equality check as below. Please follow below steps to check two numeric fields are equal or not. 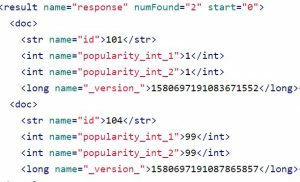 Add any two int fields called popularity_int_1,popularity_int_1. Also add one uniq field called id. Now we have sample data indexed. 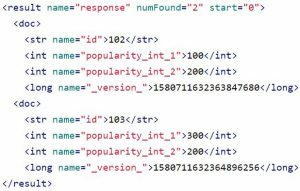 we can fire query for compare popularity_int_1 and popularity_int_2 fields are equal or not. To fetch documents which have popularity_int_1 and popularity_int_2 fields have same value. Use below query to check first number is less than second number. Use below query to check first number is greater than second number. Refer Function Query, compare two date fields , compare two string fields for more details.